A total of 20 District Line trains have been taken out of service after concerns over a bracket fault were raised following safety checks. Transport for London (TfL) said 12 trains were removed from service on Wednesday and a further eight on Thursday after interim checks. Tube services between Earls Court and Kensington Olympia remain suspended as a result. 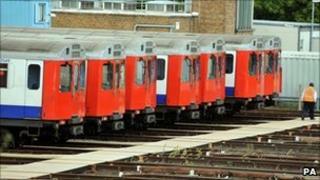 The rest of the fleet was found fit to run during interim checks, TfL said. The first lot of trains was grounded after a routine inspection on Tuesday night when engineers found cracks in several shoe beam brackets. The brackets hold the equipment which draws the current from the rails. The TfL spokesman said: "Safety is our top priority and all District Line trains are undergoing testing. "As a consequence it has been necessary to keep around 20 trains from service this morning to enable us to carry out these checks. "We are working flat out to return the full fleet to service, but will only do so once all trains have been thoroughly examined." Bob Crow, general secretary of the Rail, Maritime and Transport union said: "Short-term savings measures have slashed maintenance schedules and ripped up the safety rule book and the consequences are now being rammed home on the District line and beyond." TfL has previously denied the union's claims as "scaremongering".